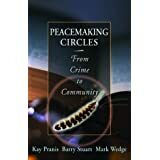 A time-tested paradigm for healing relationships and keeping them healthy, Peacemaking Circles explores how communities can respond to crimes in ways that address the needs and interests of all those affected – victims, offenders, their families and friends, and the community. Based on indigenous teachings combined with current research in conflict resolution, the Circle process described here builds an intentionally safe space where we can bring our best selves to some of our most difficult conversations. Though the book relates the process to criminal justice, the explanantion of Circle philosophy and practice can be readily applied to hurts and conflicts in other areas of life. Above all, the book offers a grounded vision for how we can be together “in a good way,” especially when it seems hardest to do.